Update: the CyanogenMod project has ceased and it is becoming LineageOS. I'll update this, or write a new guide when I know more. You can download nightly builds of LineageOS for your Wileyfox here: https://download.lineageos.org/crackling. At the time of writing, there is no LineageOS recovery. From what I've read on forums, TWRP is superior anyway - you can download it here for the Swift: https://twrp.me/devices/wileyfoxswift.html. I have not tested them as I gave my Swift away to a family member. The steps should be similar to below but as you'll be using a different recovery software, they'll look slightly different. Proceed carefully and Google if you get stuck. There are some very helpful forums out there, which have helped me get out of a bind or two before. This guide was written for Mac OS X. You'll need to substitute some instructions if you're following on Windows/Linux - Google is your friend. Also, it was written for the Wileyfox Swift 1. I have not tested it on the Swift 2; if you do, take care and let me know how it goes in the comments. I've got to admit, this took me some time to figure out. I was following the CyanogenMod guide here. Right up until step 7 of 'Unlocking the bootloader', everything was great. But then I got stuck with < waiting for any device > in Terminal. I gave it a few tries and realised the only commands that weren't working were the ones that included the vendor ID. I discovered that my device's vendor ID is different from what CyanogenMod's guide suggests it should be (I'm not sure why). This guide will include finding your own vendor ID to ensure your Fastboot commands work. There were a few other things that didn't work for me as they were specified in CyanogenMod's guide, so I've written this to cover the whole process (including installing Google Apps). If you just want to see how to get your vendor ID, jump to that section. Use a good quality USB cable. Seriously. The first time I tried this I got stuck because my USB cable was crappy. I recommend using your official Wileyfox cable as it's the best fit for the phone's USB port. Make sure your Mac (PC if you're using one) won't go to sleep during the process. Consider Caffeine for Mac or Caffeinated for Windows. Be sensible. If you don't understand something, Google it. 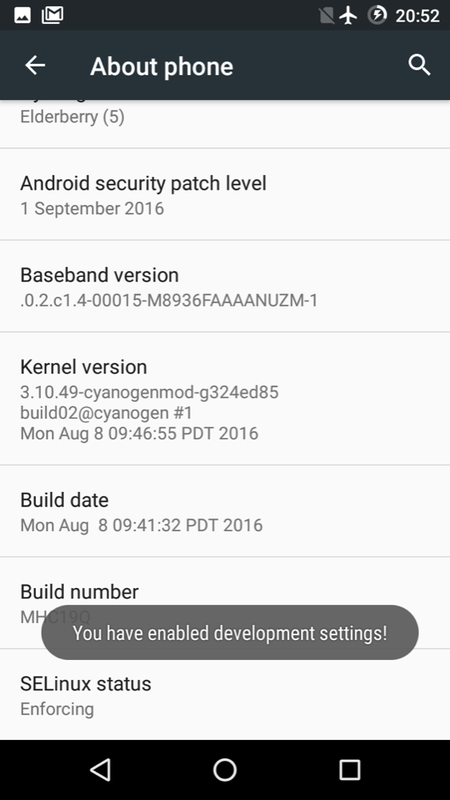 Keep this link handy, use it to download stock Cyanogen OS if you want to set your phone back to factory. You need the ARM64 version of the Android matching your CyanogenMod. I recommend Nano, it provides the basic framework, then you can download whatever else you want from the Play Store; saving space and memory. (Stock was too big for my 'fox anyway). Find out which version of Android your CyanogenMod download is running here. Compare Open GApps versions here. Scroll down to the bottom and navigate to About phone. You have enabled development settings! Scroll down to and enable OEM unlocking. Scroll further down to and enable Android debugging. You will be asked to Allow USB debugging? at this point, and presented with an RSA key fingerprint. First tick Always allow from this computer, then press Ok.
You're running this after rebooting to Fastboot deliberately. While in Fastboot my Swift reports a different vendor ID (one from Google Inc. according to System Information). You need the Fastboot vendor ID to run the following commands. With your Wileyfox still plugged into your Mac, open System Information (search for it in Spotlight). 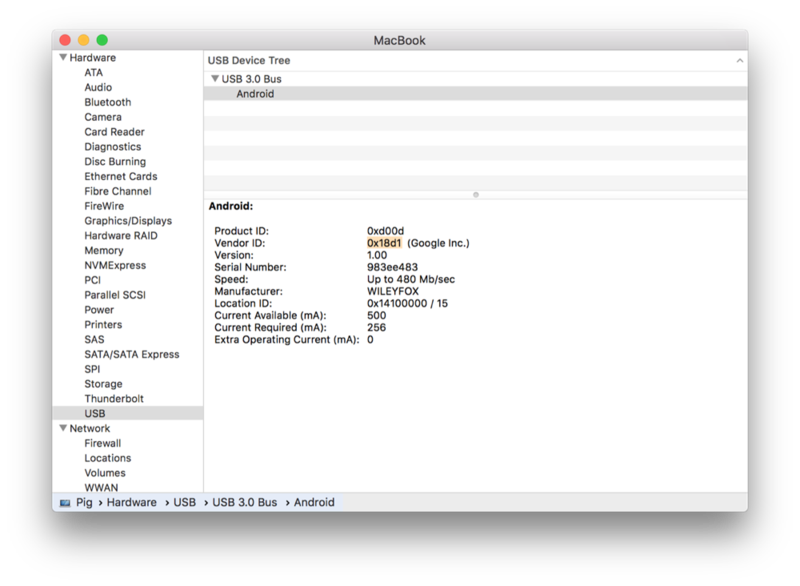 Click on USB on the left, then on Android. Copy your Vendor ID from the main screen. THIS. WILL. ERASE. ALL. DATA. Choose "yes" by using the volume down followed by power buttons. Now choose Reboot to Android. It'll take time to optimise apps so make yourself a cuppa/coffee/long glass of water. When it's done, go through the setup screens (you're resetting again so skip everything) then re-enable USB debugging (come back here afterwards). Replace /path/to/cyanogen/recovery with the full path to your CyanogenMod Recovery file. TIP: Drag and drop the recovery file into Terminal from Downloads. On your Wileyfox, select Reboot to Recovery (volume up/down to move, power to choose). Choose Factory reset from the menu. Choose Yes from the next menu. Choose Full factory reset if asked. THIS. WILL. ERASE. ALL. DATA...AGAIN. Press the back button at the bottom (left triangle) to return to the main menu. Replacing /path/to/cyanogenmod/rom with the full path to the CyanogenMod ROM (not recovery) you downloaded earlier. Don't forget to drag and drop into Terminal. Wait for it to finish uploading. **DO NOT unplug the USB cable. If you downloaded and haven't activated Caffeine(ated), now is the time to activate. Now do the same for the Google Apps package you downloaded. Skip this if you don't want Google Apps (you won't have a Play Store). In Terminal, replace /path/to/gapps with the real path. If you run into problems, post in the comments. I'll do what I can to help.